Projects are short-term goals which need to be completed according to a specific timeline. If projects are successful, your business will also turn out to be a success in the end. The successful completion of a project as planned also has the potential to make your business a success. However, to complete the project as scheduled, you need to have effective planning which should be presented in a meeting. Project meeting agenda can be sent beforehand via email so that all can attend the meeting with all the preparations. The best way for you to achieve this goal would be to prepare a project meeting agenda which would detail the tasks that need to be achieved. Therefore the agenda needs to be written in advance to be prepared for any eventualities which may arise when assigning or discussing the project. A project meeting agenda is written when the need for creating an agenda for an upcoming project meeting arises. The agenda proves helpful for all participants of the meeting especially when discussions are being held about the progress of a project. 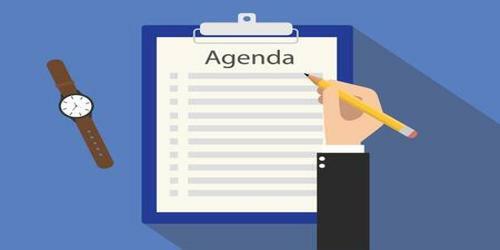 There are various reasons why different entities may decide to write a project meeting agenda. Students may write them for completing the project’s they are assigned in school or college; financial institutions may use the agenda to accomplish targets which have been set by their management and the construction industry may decide to assign projects for construction of any infrastructure. A project meeting agenda allows you to create a perfect agenda for the upcoming project meeting so that all members come prepared. It saves time, as it helps you to quickly design an agenda, and also allows the members to come prepared. It has customizable parts that can be re-designed as per your individual requirements and preferences.